Longevity brings you an advanced NEOS™ Technology driven Ozone Generator for Proven Purity (you'll receive the report), "Industry Best" Precision and Proven Quality through QAI (Quality Auditing Institute). Hands down the leading ozone generator in the North American and World Ozone Industry. Sleek, tidy, like scientific equipment should be. The Quantum 5 Oone Generator will complement any scientific environment with subtle elegance. Futuristic in every way, you can't help but stare. "On Demand" Ozone Port on the front panel releases ozone only when you push the "Port Control" switch or depress the Remote Control Foot Pedal (for hands free operation). The Internal Ozone Destruct destroys ozone internally when the system is 'idling'. ...Proof of Pure Ozone provided on our Purity Report, Proof of High Quality (20+ Reputation for Reliability), QAI.org Tested and Certified to CSA and UL Standards, Proof of Ozone Concentration Precision. Yes..Breathe a sign of relief with Longevity Ozone Generators! 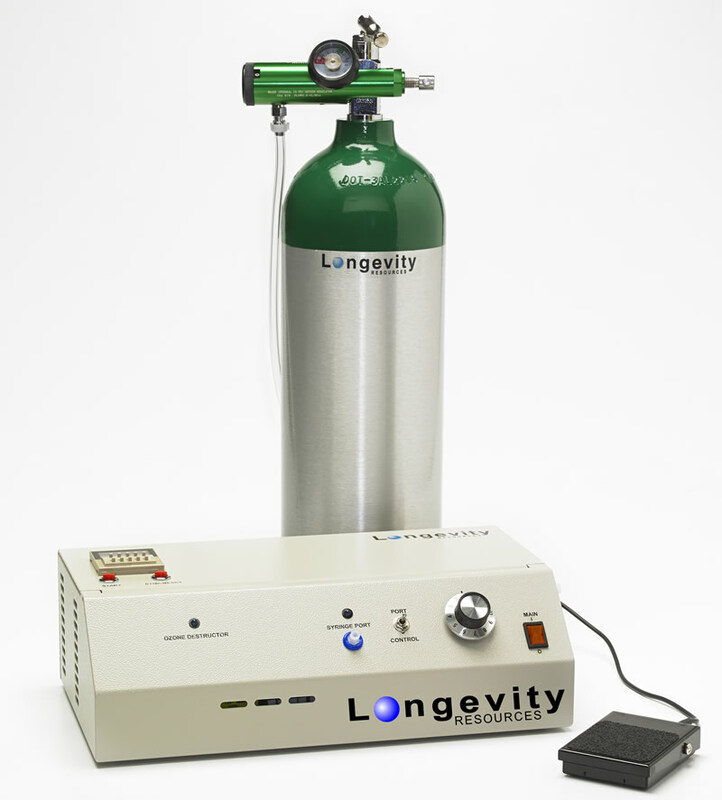 Longevity's QUANTUM 5 OZONE GENERATOR Provides the most advanced ozone technology in the world today at a price that is within easy reach of any professional. LONGEVITY'S unique Quartz Glass Electrode Guarantees "ULTRA PURE OZONE" in the range of 1ug/ml to 120 ug/ml, the widest range in the world. Proven Purity, Proven Quality, and Proven Precision...you'll find it all in the Quantum 5 Ozone Generator. Safe, easy, accurate delivery of the ozone is guaranteed by the front panel mounted "On Demand" Ozone Output Port. You control the release of the ozone using the panel mounted Toggle Switch. When precision volumes of ozone are required, the Port allows the direct attachment of a Luer Lock style syringe. Simply attach the Syringe, flip the switch, and watch as the syringe fills itself to the desired volume. Releasing the switch stops the ozone flow and directs it to an 'On-board' Ozone Destruct Unit which will then destroy any ozone gas that is being created to ensure that none of that gas enters the room around you. If you need to transport a higher volume of gas to another location, simply attach and fill a higher volume ozone resistant bag, or, simply attach an ozone resistant silicone hose to the Ozone Output Port and direct the ozone right to the place where you need it. The Quantum 5 is manufactured in North America using North American Components, design, and workmanship. By combining the unique qualities of leading edge design and engineering, the highest quality components available in the world, and manufacturing in our QAI (Quality Auditing Institute) inspected factory setting, Longevity Resources Inc. has once again set the "Gold Standard" for quality ozone systems. 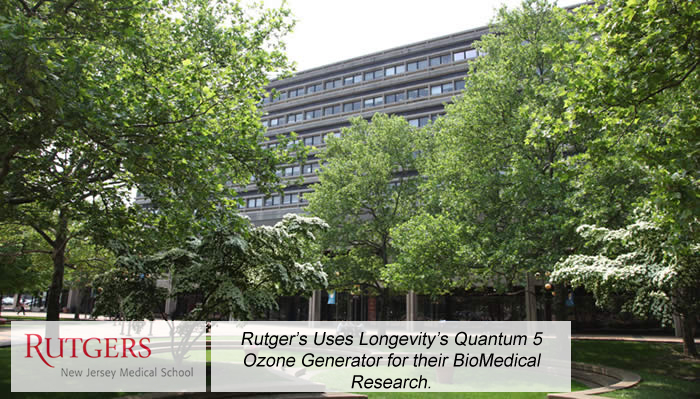 No wonder Longevity ozone generators have the reputation of running reliably for over 20 years! We display our commitment to quality and safety with our Proven Quality Approval (through QAI) to CSA and UL Standards, our Proven Purity Test, and our Proven Precision. We display our commitment to you the customer through our Lifetime Warranty, and our phenomenal reputation for providing unequaled Customer Support. You'll be happy you teamed up with Longevity! A 20+ Year industry reputation for reliability and the best Testimonials in the industry. Rigorous testing and inspections by an independent laboratory QAI.org and Certified to North American CSA & UL Standards. Further testing certified to European CE Standards! Without a shadow of a doubt you know the Quantum 5 Ozone Generator is extremely high quality and reliable. All companies are claiming that their ozone is pure. Do they have proof? Longevity is the only company, in the world (!) to prove that our ozone is pure! Independent laboratory testing proves, without a doubt, only the highest level of purity. This level of purity is only possible due to the fact that only Longevity uses a 100% Quartz Glass lined Electrode which ensures the ozone never touches any metal, ceramic, rubber, plastic, glues, resins, nor any other material that would otherwise contribute contaminants to the ozone gas. Each Quantum 5 Ozone Generator is tested for Ozone Output using the Oxygen Regulator that is being provided with the ozone generator. This gives the Ozone Output Report an unequaled level of precision, taking into account that no two Oxygen Regulators are identical. Premium Ozone Technology (see below) ensure that you can trust that the Ozone Concentration levels will remain accurate long term. Longevity is committed to providing you with only the highest quality electrical components coupled with state of the art circuit designs to create NEOS Technolgy - the most advanced ozone technology available in the world today. This magic combination of quality components and cutting edge design ensures reliable worry free operation of your ozone system for many years to come. That's the Longevity way! 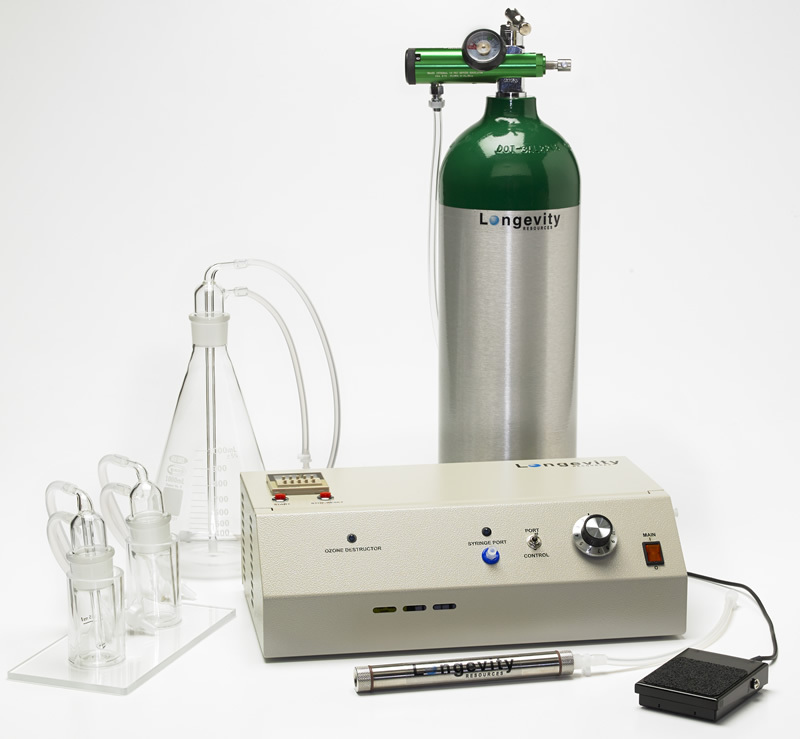 The Quantum 5 Ozone Generaotor offers the widest range of ozone concentrations in the world providing over 90 choices of "Micro Ozone" levels of less than 1 ug/ml through to an amazing 120 ug/ml ozone concentration. Rest assured you will be able to perform any ozone protocol from anywhere in the world. Produces up to 120 ug/ml, Includes "On Demand" Panel Mount Syringe Port with Remote Control Foot Pedal, Built in Digital Timer, Internal Ozone Generator (to destroy the ozone that is created when the ozone generator is 'idling'). Longevity Product Specialists can assist you to add any Ozone Accessories you may need, to create a custom package that suits your exact requirements and budget. Call or Email Longevity today for more information and pricing! Any Other Accessories to suit your needs are available => Ask one of our Product Specialists for Help Choosing What you need! Longevity Product Specialists can easily and quickly customize this or any of our packages to ensure that you have an ozone system that meets your exact needs, and your budget. Call or Email Longevity today for pricing and / or for assistance in creating a custom package. We are here to help you! "On Demand" Ozone Output Port right on the front panel. No cumbersome external equipment necessary! Attach a Syringe, Bag, or Tubing to the front Panel and Release Ozone only when you need it by depressing the Toggle Switch, or Remote Foot Pedal. includes built in Ozone Destruct! All companies will tell you their products are high quality. But where's the proof? Longevity is unique with Proven Quality earning a 20+ Year Reputation for Reliability. Rigorous testing and laboratory inspected by QAI.org and Certified to North American CSA and UL Electrical Standards. CE Approved to European Electrical Standards. Longevity obsess about quality...so you don't have to...and we prove it so you can feel comfortable and confident with a Longevity purchase. 5 Year Warranty on the body of the sauna, 3 Year Warranty on electronics. 120 Day Satisfaction Guarantee: Longevity pays all shipping for components that qualify for warranty replacement. 30 Day Money Back Return Policy. (See details when purchasing). Weighing in a only 7 pounds (3 kgs) the Quantum 5 Ozone Generator is ideal for Table Top use, mount it on any shelf on the wall, mount it vertically on the wall, or place on a shelf on a movable cart or pole. 110 - 120 Volt AC 60 Hz 0.4 Amps. Also 220 - 240 Volt 50 Hz 0.2 amps. Use the Quantum 5 in any country in the world. Lowest amperage on the market, lowest electricity consumption => runs cool, accurate, and inexpensively. We ship all of our products Worldwide on a daily basis. Product is in stock and ready to ship immediately to all worldwide destinations. Order today!